About fifteen years ago, right at the start of my brilliant career, I arrived in the office to find one of my colleagues in tears. I've always been a relatively early starter, so it was probably around 8am and John and I were the only two people in our team in the office. Everything seemed normal to begin with, but then John, a contractor who was probably in his forties, suddenly started to sob at his desk. I had absolutely no idea how to react. As a human being, and the only other human being there, it was obviously my duty to go over to his desk and ask if he was okay, but I can distinctly remember that this was all I had. Once I'd played that card to a grown man sobbing at his desk, all I had left was to offer to get him a cup of coffee. It was pathetic, but I simply did not have the emotional toolkit to respond to the situation. Whether or not I can blame this reaction upon my schooling or whether or not it's an intrinsic part of my emotional makeup and personality type, I suppose we'll never know. It doesn't really matter. I was sent to a boarding school when I was seven years old and spent the next eleven years concealing my emotions because an open display of emotion makes you a target in that sort of environment. Hugging and learning was definitely not encouraged and only served to open you up to ridicule. I may well have been an introvert already - I was a bookish child - but I'm pretty sure that the environment I was in sealed the deal on my (lack of) emotional development. It's nobody's fault, it's just the way things were. I'm older and wiser now, of course. Have I changed? Well, I popped round to see a friend at work this evening. I'd been meaning to pop round earlier, and I only had a couple of minutes before I needed to shoot off if I was going to make it to running club, but I wanted to make the effort to at least say hello. When I got to her desk, everyone around her had gone home and she was alone. She was a little quiet, so I helped myself to a chocolate from the team tin and then realised that she was quietly sobbing. Again - still - I had absolutely no idea to react. Just like fifteen years ago, as a human being, and the only other human being there, it was obviously my duty to go over and make sure that my friend was okay, but again, this was basically all I had. I ascertained that it was work problems rather than personal problems, which I guess is the lesser of two evils, but other than vaguely commiserate and offer a bit of half-arsed sympathy, I honestly didn't know what I should be doing. The time pressure didn't help, and I left my friend feeling like I must be one of the crappest, most emotionally stunted people ever to live. Apparently, the Star Wars character that best represents my Myers-Briggs personality type is the Emperor. 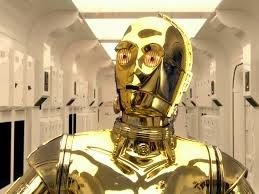 Well, sometimes I just feel like C3PO. Bright but of no practical use what-so-ever and with absolutely no understanding of people at all. Nearly forty and apparently no more emotionally developed than I was at seven. I can only apologise to anyone and everyone who probably has a right to reasonably expect more than this from me.... especially to my friend from this evening. If you're reading this, then I honestly wanted to do more but didn't know how. I hope you're doing okay.